← How to show PDF in web and disable downloading ability? Question: I want to replace text in an existing PDF with image. Can this be done with VeryPDF software? Actually I want to replace all the text company name to our newly designed company image logo? 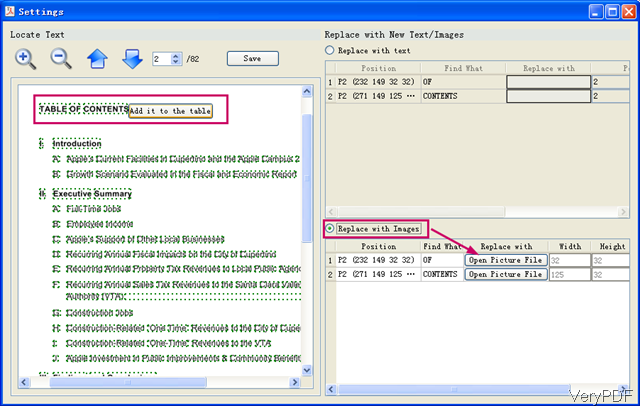 Answer:According to your description, VeryPDF software VeryPDF PDF Text Replacer caters to your needs. There are two versions of this software: GUI version and command line version. Both of those two versions can satisfy your needs, so you can choose the proper version according to to your needs. And here I will take the GUI version for example. Meanwhile this software also can help you replace text by text, replace image by image and others. Please check more information of this software on homepage, in the following part, I will show you how to use this software. As this is Window GUI version, when downloading finishes, it is an exe file. Please install this software by double clicking the exe file and following installation message. Step 2. Replace text with image. 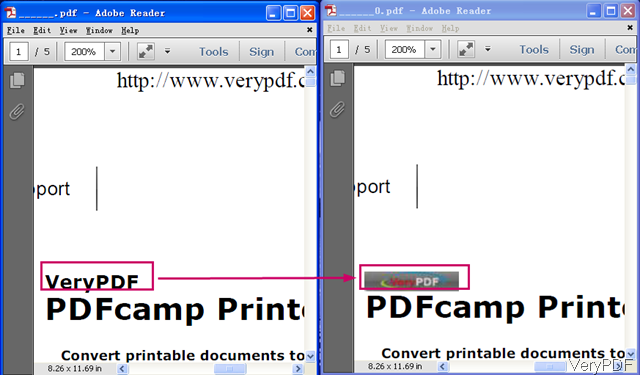 When open software interface, please click button Add to add PDF file to software interface. Then choose the output folder by clicking folder icon on the desktop. Please click button Setting then you will enter menu tab like the following snapshot, please have a check. In the left preview part, there are green boxes around the text. Please right click it then you will see reminding message like in above snapshot Add it to table, please click it. The the text you need to replace will be shown in the right part. Please choose the second part Replace with Image. The text detail position of the text will be shown there, so even if the same font you need to replace will not be wrong. Please click button Open Picture File then you can open your company logo to replace text with image. When you finish setting, please click button Save then you can back to main interface. Click button Replace the process will be launched at once. Please check the replacement from the following snapshot. The command line version can do the same job like the GUI version. If you need to do the replacement from C# and others, please choose the command line version. During the using, if you have any question, please contact us as soon as possible. How to replace text in PDF by force stamp? This entry was posted in PDF Text Replacer and tagged replace text. Bookmark the permalink.